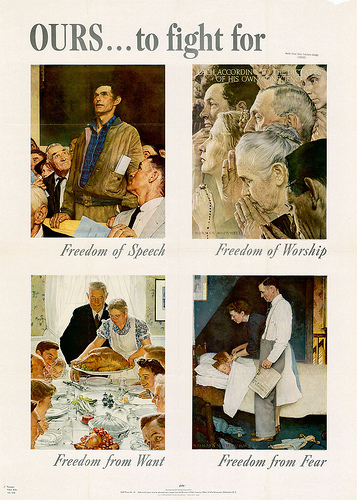 [UPDATED] In his 1941 State of the Union address, a year before Pearl Harbor and the entry of the US into World War II, President Roosevelt presented the Four Freedoms: freedom of speech and express, freedom of religion, freedom from want, freedom from fear. They expressed a worldview diametrically opposed to the fascism and tyranny that wasascendantat the time and described a world the US might soon need to fight for. In two days…we’ll celebrate Human Rights Day, which is the anniversary of the adoption of the Universal Declaration of Human Rights…. as people increasingly turn to the internet to conduct important aspects of their lives, we have to make sure that human rights are as respected online as offline. TheUniversal Declaration of Human Rights is a valuable resource for policy, but it is not tremendously actionable. The declaration includes 30 articles, some of which include two or three sub-sections. Which rights are most important in the online space? Which do not apply? Which should be defended as US policy priorities? Which should be considered secondary? These are real and difficult policy questions for the US State Department. What is needed is a shorter list of critical needs that are specific to the internet. The Four Freedoms provides a good template for this. The State Department is in a way already leaning in this direction. They have an office of Internet Freedom programs, not Internet Rights programs. “Net freedom” is a byword for proponents anddetractorsof the US’s global internet policy. This is the first freedom of the internet, without which none of the other freedoms can be exercised. Though sometimes access to the internet is explicitly denied to citizens, as in North Korea, throttling bandwidth,inflatingcosts, and creatingclosed national intranetsare more subtle ways to prevent mass access to the global internet and to make that access less useful. After the 2009 elections, the Iranian government employed throttling to make the Internet slower and less useful for media sharing by apportioning less bandwidth to its ISPs. According to Reporters Without Borders, access to the international internet costs$5 to $7 in Cuba, while the average monthly salary is just $20. Both Cuba and North Korea have also created national intranets, which allow a select few to get online, but not to access the global internet. Information must be able to flow freely to and from every citizen. Citizens need accurate information before they can make decisions and take action in their own best interest. In the age of social media, citizens can also gather and share their own information and opinions with their fellow citizens and use the internet to give calls to action. A citizen’s passiveaccess to information is not sufficient. The freedom to produce and broadcast information and opinion, todebate it, and to give calls to action as a result of deliberation, are also critical to a functioning democracy. Regimes that censor speech – at point of expression, point of search, or point of access – all contravene this right. China’s weibo microblog services prevent members from posting politically sensitive words. When it first entered China, Google was famous for censoring its search results (for example, of Tiananmen Square). Many nations,particularlyin the Persian Gulf, block web pages, which means that even when the correct web address is entered in the browser, the site is not displayed. The offline freedom tocollectively express, promote, and defend common interests must also be recognized online. In the 1990’s it was presumed that the main function of computers and the internet would be as a source of information. Though the term “information society” was coined in the 1930’s, its popularity spiked in the 1980’s and 90’s(see graph at left). The term “information superhighway” emerged and gained popularity at the same time. As late as 2003, the eminent political scientist Bruce Bimber titled his book on technology in the evolution of political power Information and American Democracy. Yet we don’t use these terms anymore. Use of the term “information society” peaked in 2000 (see graph above) and fell thereafter. What happened? Social media happened. The internet was longer a place exclusively for information, but also for socializing, relationships, and connections. There is even evidence that freedom of collective action is more important to citizenship that freedom of information. The mass emergence of digital activism followed closely upon the emergence of social media, not the emergence of personal computers or the internet. According to our Global Digital Activism Data Set, grassroots digital political action existed at a low variablerate through 2005, then increased exponentially from 2006 onwards. In the data wet, which spans1,255 case studies from 144 countries, the information effects of the Internet, which one would expect to emerge in the mid-nineties, are not pronounced. During the mid-to-late 90’s, when public internet access first emerged, there are few digital activism cases. Interestingly, mass growth in digital activism also does notcoincideclosely with the emergence of blogging in the early 2000’s, which is primarily a form of peer information and opinion-sharing. What it does cooincide with is the emergence of social networks: in September of 2006, Facebook became accessible to anyone over 13 with a valid email address. Contravening freedom of online assembly means preventing people from accessing or freely using social platforms, such as social networks (Tunisia blocked Facebook in 2008, it is currently blocked in China) or other platforms thatfacilitateonline collective action and aggregation of effort, such as e-petition sites, wikis, online message boards and forums, and listservs. Citizens need to be able to use the internet for political purposes without fear of reprisal. In his 1941 speech, Roosevelt defined the freedom from fear as a state of the world where “no nation will be in a position to commit an act of physical aggression against any neighbor.” Political action online is still liable to result in the physical aggression of the state, not aimed against another nation, but at the state’s own citizens. A citizens can have access to the full range of online platforms, at low price and high speed, but if she feels that her actions may get her in trouble with the government, fear may prevent her from acting or even speaking in favor of her political interests. Such a situation is inimical to a functioning democracy.